This Coffin Flag Case, Memorial (casket) sized flag case is available in your choice of Oak (shown) or Walnut. The base is the perfect place to mount an engraved plate for your message. This Coffin Flag Case, Memorial (casket) sized flag case is available in your choice of Oak (shown) or Walnut. The base is the perfect place to mount an engraved plate for your message. 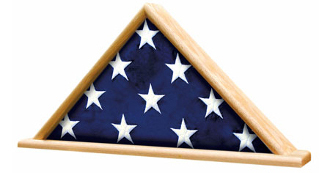 Accommodating a 5' x 9.5' burial flag - this case is 12.75" high and 26" wide. A high quality way to protect and display your cherished flag.